Commissioned as a Marine Corps Officer in 1954 and attended the Marine Corps Officer Basic School at Quantico, Virginia. Served in USMC Fighter squadrons until selected by NASA. Worked on the devekopment and testing of the Lunar Roving Vehicle(LRV) used on Apollo 15,16 & 17. 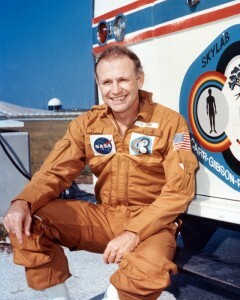 November 1973-February 1974, CDR of Skylab 4, the longest US spaceflight until the advent of the Shuttle-Mir and ISS programs in the mid to late 1990’s. Conducted three spacewalks including one to photograph the comet Kohoutek during it’s closest approach to Earth. In mid 1977 named head of the design support group at NASA working on STS systems. 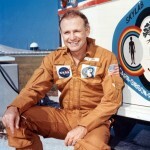 Retired from the USMC on August 22, 1975 and left NASA in June of 1977. From 1977-81, Senior Vice-President with Bovary Engineers Inc., Houston, Texas. From 1981-83, Senior Consultant to the President of Applied Research Inc. in California. From 1983-85, Manager of the University of Texas 300 inch Telescope Project. In 1984, founded Camus Inc., with his wife. The Corporation provides technical support services in Zero-G human factors engineering, analysis, training and systems integration as well as promoting his wife’s art work.